Team Elliott Education creates an energizing environment for both residents of healthcare and memory care communities as well as loved ones living at home. Innovative, socially interactive and intellectually stimulating programs are provided while respecting the integrity of each individual. Since the program’s inception in August 2008, more than 500,000+ engagements have been logged. Opportunities for intellectual stimulation are available for all seniors within independent, assisted and memory care communities. Programs also offered for loved ones living at home. 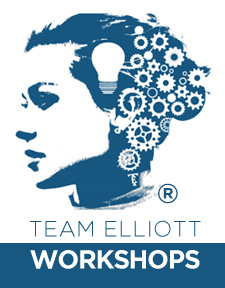 Raising awareness and providing a higher standard of intellectual care, within healthcare communities, fuels the engine that drives the concept behind Team Elliott Education. Participants experience visual memory activities, sequencing, and problem solving skills, art, rhythmic patterns, musical experiences, processing skills of investigation, discovery, experimenting and more! 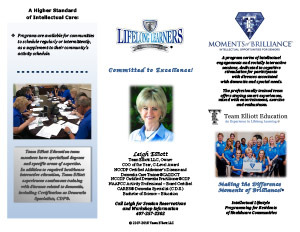 Creatively utilizing content resources, technology, and professional experience in the planning, preparing and session presentations, Team Elliott Education offers meaningful programming for lifelong learning within healthcare communities. 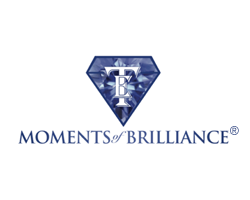 According to Leigh Elliott, owner, teacher and concept creator, “Residents’ brilliance shows up everywhere. It is exciting to offer opportunities which encourage those moments and thrilling to observe the empowerment experienced by participants."